Probably more like 3.5* but I was pleased enough to immediately order the second Peter Grant book after finishing this one. 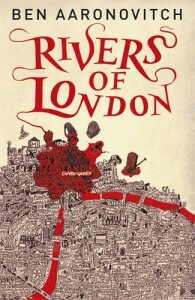 A novel set in London – with magic and a surrounding cast of anthropomorphic entities – was bound to tickle my fancy. A story told from a male point-of view was a nice change from my recently YA-heavy reading diet, although Peter’s hopeful focus on sexual exploits tended to get on my nerves. Hang on, I’m being a bit unfair here, because that was actually something that annoyed me in the second part of the series. This one was more concerned with introducing the characters, premises, and magic system, and the solving of the crime – and it was really well done. The tone and humour were right up my alley. The exchanges between Peter and fellow probationary Constable Leslie alone were well worth the read. It’s deadpan, but never condescending or elitist. Peter seems like an honest guy. I guess there are aspects of his character, which might show him in a less favourable light, he decides not to explore too deeply in this book, but he is not above presenting himself as the receiving end of a joke.